This is one of my favorite summer skirts – not just because of the fabulous blue ikat design, but because it’s also lightweight and comfortable. It’s simple to make, and I love the combination of elastic and drawstring at the waist. I posted instructions for this skirt MANY years ago, but thought it would be perfect to post again for a Summer of No Pants project. It gets awfully hot and humid in the South during the summer, especially in August. Lightweight cotton skirts help keep breezes flowing and body temperatures down. They’re simple to make; the hardest part is finding fine, lightweight cotton fabric! Look for lawn, voile, gauze, and similar weight fabrics. • Three ¼” or smaller safety pins. • Cut a 1” strip from one end of the fabric, across the entire 45” width; this is for the drawstring. Note: If using Binder #88, cut the strip to fit the binder opening. • Cut a 4” strip from one end of the remaining fabric, across the entire 45” width; this is for the waistband. Tip: If your hips measure more than 45”, add more length to the drawstring and waistband with the same or a coordinating fabric. • Cut the remaining fabric into two equal lengths; these are for the front and back of the skirt. Attach an all-purpose foot and set the machine for a straight stitch. Place the front and back wrong sides together. (No, that’s not a mistake; place them WRONG sides together. You’ll see why soon.) Stitch the side seams using the edge of the foot as a guide (the seam allowance will be a little larger than ¼”). Press the seam allowances open. Don’t skip this step! It makes the following steps much easier to do. Trim the seam allowances to about ⅛”. Fold the front and back right sides together along the seamlines. Stitch again, using the edge of the foot as a guide. The raw edges will be enclosed inside the seam allowances, creating a nice finish inside and out, and eliminating any chance of the fabric edges raveling. I like the adjustability of a drawstring with the addition of elastic. Stitch the short ends of the waistband together using the edge of your all-purpose foot as a guide. Press seam allowances open. The seam line will be the center front of the skirt. Lay the skirt flat, right side out, folding it so the seam lines match. Mark the folds at the sides; these indicate the center front and center back of the skirt. Fold the waistband in half with the seam (center front) at one side; mark the opposite for to indicate the center back. Mark the side seams halfway between the center front and center back. Fold waistband in half lengthwise, wrong sides together, matching the long raw edges; press. Gather the upper edge of the skirt to the length of the waistband using your favorite method: zigzagging over a length of cord using Embroidery Foot #6 or Clear Embroidery Foot #39/39C (insert the cord through the guide between the toes), or two lines of basting stitches. Attach the seam guide to the back of the all-purpose foot. Set it for ½”, using the lines on the stitch plate as a guide. Stitch the skirt to the waistband, matching marks, using a ½” seam allowance. 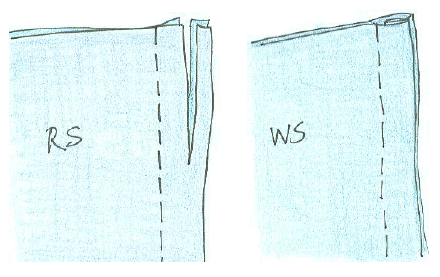 Finish the raw edges of the waist seam allowances using an overlock stitch or a serger. 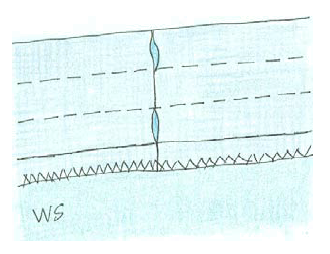 Stitch ½” from the folded edge, guiding the fold along the seam guide. This forms the top casing. 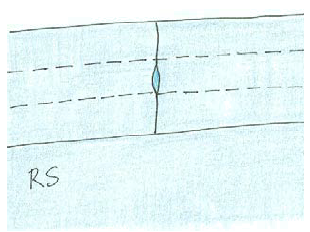 Stitch again ½” below the first line of stitches, aligning the previous stitching with the seam guide. This makes the middle casing. Repeat once more to create the final casing. Cut the elastic into two equal pieces. On the inside of the skirt, use a seam ripper to open the center front seam at the upper and lower casing. Attach a safety pin to one end of each piece of elastic. Anchor the other ends to the skirt with a third safety pin. Insert elastic into upper and lower casings. After threading the elastic, pin the ends together. Try on your skirt and adjust the elastic to fit. Stitch the ends together with a zigzag stitch. Fold the drawstring in half lengthwise, right sides together. Seam the long edge with a scant ¼” seam allowance. What is a “scant” ¼”? Locate the ¼” mark on the stitch plate, right in front of the feed dog opening; a “scant” ¼” is just a bit to the left of the mark. Use a safety pin to turn the tube right side out. Notice how the seam allowances make a sort of “filler” for the tube? On the outside of the skirt, use your seam ripper to open the center front seam at the middle casing. Attach a safety pin to one end of the drawstring; insert it into the middle casing and pull through. Knot the ends of the drawstring. Fold up ¼” to the inside along the lower edge of the skirt; press. Fold up another ¼”; press again. Attach an edgestitch foot to the machine, set it for a straight stitch, and move the needle 2-3 steps to the right. With the wrong side of the skirt facing up, place the hem under the foot with the inside folded edge against the right side of the guide. Stitch. I’d love to see pictures of your skirts! Send them to blog@berninausa.com and I’ll create a photo gallery in this post.